There were The Beatles, The Rolling Stones, The Who, and of course Sticky Fingers. The band consisted of Ivan, Frank, JB and Sandro and this is their story. Sounds like I’m writing a rock review, right? A Story of Men is an illustrated story about four men in a band called Sticky Fingers. They should have made it big in Rock and Roll, but things didn’t go so well for them. Our story begins with three of the band members heading to England to meet of with one of the members that made it big on his own. Each one of the guys has their own subtle backstory, but our author focuses primarily on the one. Zep has created a fantastic rock story which brings our character together when they needed each other the most. His art and line style works really well for this book. It has all the necessary detail to help illustrate the story. He uses one color to set the tone and create space on each page. The book mostly has cool colors in the palette. The book is 64 pages of a fantastic and touching story about life’s expectations and some revelations along the way. 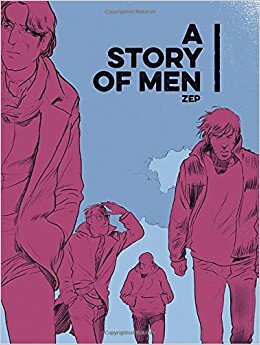 Zep portrays his character perfectly and puts them in a real place for the reader including the fact that most rock stars get hair implants. It feels more human than most comics you’ll typically read and hits all the right notes.